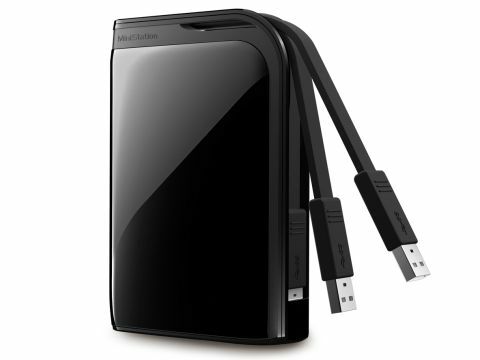 Like its stable mate, the Buffalo MiniStation Plus, the MiniStation Extreme is a small, though not particularly light, USB 3.0 external hard drive. When we say small we're of course referring to the drive's physical dimensions, not its capacity. Within its small frame lies a whopping 1TB of disk space - more than enough for most people's needs. When we say not particularly light, this is because of its shock-resistant casing. But how well does it perform? When plugged into a standard USB 2.0 port the disk manages read and write speeds of around 30MB/s. Plugged into a USB 3.0 port, however, the write speeds leap to an average of 85.73MB/s, with read speeds a very good 94.87MB/s. Very handy LED lights on the front of the drive let you know which port you've plugged the Buffalo MiniStation Extreme into - green for USB 2.0 and Blue for USB 3.0. If you stick it in a USB 3.0 port and it insists on glowing green, make sure you've downloaded and installed the latest USB 3.0 drivers for your motherboard. As out tests show, it really is worth using in the newer, faster USB ports. The Buffalo MiniStation Extreme also comes with a host of programs we've come to expect from Buffalo devices. As with the Buffalo MiniStation Plus, these programs don't add much, and after installing it can be a pain to completely uninstall them from your system, with folders left all over your system's hard drive. The Buffalo MiniStation Extreme works perfectly well without these programs, and we recommend not installing them. As for the shock-resistant casing we mentioned earlier, it includes US Military-grade shock protection and shock absorbers that surround the hard drive. It certainly feels very robust, and Buffalo states it can withstand falls of up to two metres. So it might not survive being dropped out of a window, but it'll be fine being knocked off a table, or put in a bag and forgotten about until someone chucks it across the room. It's not indestructible, but the Buffalo MiniStation Extreme makes a nice change from some of the dangerously flimsy external hard drives we've tested. It's fast, too, once you ignore the programs that come with the external hard drive.